The test rig consists of two steel monopoles grouted into sockets drilled into the seabed, with a platform suspended from the piles to provide a working area. The turbine, which is six metres in diameter, is fixed to the piles using two steel collars, which allow the unit to be lowered into the sea using two 15 tonne hydraulic winches. The test rig allows for the turbine to be raised out of the water easily, reducing the cost and time for testing, maintaining and updating the device. The turbine is composed of 16 ducted fins and an open center to allow marine life to pass through. No lubricating fluids are necessary as there is only one moving part and no seals, as electricity is generated with a permanent magnet instead of a gearbox. The design is scalable to create larger turbines in the future. The device was installed at European Marine Energy Centre (EMEC) tidal device test area in Fall of Warness, Orkney. There are strong tides of up to 8.5 knots and an extreme weather climate to test the device. The European Marine Energy Centre (EMEC) was established in 2003 by Highlands and Islands Enterprise (HIE) and funding partners, and gained their United Kingdom Accreditation Service (UKAS) in 2005. Accreditation by UKAS demonstrates the competence, impartiality and performance capability of these evaluators. UKAS is a non-profit-distributing private company, limited by guarantee. UKAS is independent of Government but is appointed as the national accreditation body by the Accreditation Regulations 2009 (SI No 3155/2009) and operates under a Memorandum of Understanding with the Government through the Secretary of State for Business, Innovation and Skills. The device shall be marked as a Special Mark with the topside structure painted yellow and fitted with an all round navigation light flashing yellow every five seconds (FI Y 5s) with a nominal range of 5 miles. The Statutory Sanction of the Commissioners of Northern Lighthouses must be sought to deploy and subsequently remove the proposed buoy stations.Prior to deployment, the Licensee must complete the 'Application for Statutory Sanction to Alter/Exhibit' form and submit the form to the Northern Lighthouse Board either by fax (0131-220-0235) or e-mail (navigation@nlb.org.uk) for the necessary sanction to be granted. Although the marking requirements are a matter for the Northern Lighthouse Board, the recommendations at Section 8 of the Navigational Risk Assessment (ARC-160-001-R1) are agreed and are a condition of this Licence. The Licensee shall ensure that all temporary deposits are removed upon completion of the works to the satisfaction of the licensing authority for disposal at an approved location above the tidal level of Mean High Water Springs. Should the Licensing Authority consider it necessary or expedient to remove all deposits made under authority of this licence, for the purpose of protecting the marine environment, the living resources it supports and human health, or of preventing interference with legitimate uses of the sea, the Licensee shall undertaketo remove those deposits in accordance with the requirements of the Licensing Authority. The Licensee shall where appropriate, undertake monitoring of .the area pre and post installation and post decommissioning of the deposits on the sea bed subject to this licence. The monitoring shall incorporate, if deemed to be necessary by the Licensing Authority, physical, chemical and biological investigations, to access the status of the authorised deposits and their impact in the receiving environment. The scope, frequency and spatial extent of the investigations shall be approved by the Licensing Authority. Successive operations at each of the berth sites will only require monitoring to be undertaken if the new operation results in any additional deposits on the sea bed. The Licensee shall submit a decommissioning Plan to the Secretary of State in compliance with a notice served upon the Licensee by the Secretary of State following consultation with the Scottish Ministers, pursuant to Sections 105 (2) and (5) of the Energy Act 2004. The Licensee shall ensure that no drilling or pile cutting works are undertaken below the tidal level of Mean High Water Springs during the period of June to 14th July without written agreement of the Licensing Authority. Should it be necessary to seek the agreement of the Licensing Authority this must, normally, be requested in writing no later than 21 working days in advance of the proposed start date. The Licensee shall ensure that prior to the commencement of drilling or pile driving or pile cutting works a dedicated watch will be kept to ensure that no cetaceans are within 200m of the perimeter of the berth site, as described in the protocol issued as part of this licence. A formal log will be maintained, whether or not cetaceans are sighted and the completed log(s) will be returned to the Licensing Authority quarterly. The Licensee shall ensure that all works are undertaken in accordance with the proposed mitigation and commitments register stated in the Open Hydro Supplementary Environmental Statement: Deployment of a Subsea Tidal Turbine at the European Marine Energy Centre (EMEC) issued on 1st August 2007. Established in 2005, Dublin-based OpenHydro designs and manufactures marine turbines to generate renewable energy from tidal streams. 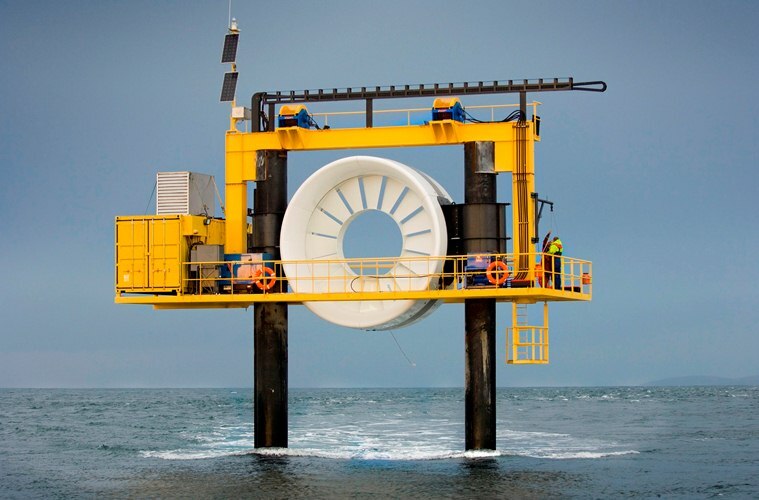 OpenHydro was the first developer to use the tidal test site at the Fall of Warness off the island of Eday when its test rig and 250kW open centered turbine were installed in 2006. The device was the first tidal turbine to be grid connected in Scotland and subsequently the first to successfully generate electricity to the national grid in the UK in May 2008. As the Open-Centre Turbine was designed to be deployed directly on the seabed using a gravity base, OpenHydro placed a blank, non-grid connected turbine on the seabed adjoining their test rig using the specially commissioned “OpenHydro Installer” in summer 2008. Though the original turbine is no longer in testing, OpenHydro continues to bring subsequent generations of their device for testing on their test rig. Their 7th generation 6m diameter turbine was installed in their test rig in April 2014 and accrued over 10,000 hours of run time. In April 2017 a Marine License (06282/17/1) was issued for an OpenHydro Two Turbine Demonstration Array, scheduled to commence in 2018 with an expected operating life of 25 years. Unfortunately in July 2018, project partner OpenHydro’s parent company, Naval Energies, made the decision to liquidate OpenHydro. The test rig remains in its berth at the Fall of Warness. There is a decommissioning bond in place which will be used to decommission the rig, however although nothing has been announced or confirmed, there may be opportunities to utilize the test rig infrastructure in the future. For the impact assessment process, all possible interactions were first identified and then screened to establish the likely areas of significant effects. Orkney is recognized as an important area for a number of marine species, with various conservation and protected sites in the areas surrounding the tidal test site. The key issues to consider for all marine mammals and diving birds relate to concerns over the potential for damage to wildlife that may occur as a direct or indirect result of collision between the animal and moving underwater device parts. There are also concerns about the potential for disturbance or harm to marine wildlife species that may be caused by waterborne noise associated with construction, operation, and decommissioning processes, or disturbance that may lead to species being deterred or displaced from their habitual breeding and/or feeding grounds. OpenHydro at EMEC is located in United Kingdom. Visual Surveys: Evidence of otter activity where suitable habitat is present along the south west Eday coastline. Where suitable habitat is present along south west Eday coastline, otter resting sites, feeding areas and potential holts have been identified. Otters normally cub in the winter months in Orkney, although they can breed at any time of the year. Due to lack of evidence it is not possible to identify a seasonal sensitivity for the otter, but due to this European protected status any disturbance of these species would receive a high sensitivity ranking. Visual Surveys: Haul out sites on Muckle Green Holm and Little Green Holm (SSSI sites), and Seal Skerry. Movements of seals through the Fall of Warness area are unknown. Common seals pup in early June and July, and this is followed by a moulting period in late July and early August. The closest haulout sites to the proposed facility are at Seal Skerry, The Graand (on the south coast of Eday), and on Muckle and Little Green Holms. The moderate sensitivity refers to the risk of pup abandonment due to disturbance, which can increase the mortality rate. Visual Surveys: Haul out sites and breeding colonies on Muckle Green Holm and Little Green Holm (SSSI sites) and Faray and Holm of Faray (SSSI and marine SAC). Haulout site on Seal Skerry and The Graand. Movements of seals through the Fall of Warness area are unknown. The grey seal breeding season is from early October to late November. The moulting period follows in January to March (females), and March to May (males). Grey seal breeding colonies are located on Muckle and Little Green Holms, and Faray and Holm of Faray (approximately 4 km north of Seal Skerry). The moderate sensitivity refers to the risk of pup abandonment due to disturbance, which can increase the mortality rate. Visual Surveys: Harbour porpoise are regularly observed in Eday waters. Other species that have also been recorded in the area include: minke whale, killer whale, pilot whale and white-sided and common dolphins. Minke whale, killer whale, pilot whale, harbour porpoise and white-sided and common dolphins have all been recorded in the Fall of Warness, but there has been no systematic watching of cetaceans in this area. Shore birds – ringed plover, meadow pipit and rock pipit. Visual Surveys: Nest on beach below Cauldale. Ringed plover, meadow pipit and rock pipit use the stretch of coast below Cauldale for nesting from May to the end of July. Visual Surveys: Important breeding colony on Little Green Holm. There is an important cormorant breeding colony on Little Green Holm (April-June). If the birds are disturbed there is a risk that gulls will steal the eggs. The Fall of Warness is used for passage by cruise liners and pelagic fishing boats, creel fishermen regularly fish the inshore shell fishing grounds, and the inter-island ferries use a number of routes through the channel which vary in response to tidal and weather conditions. No Scheduled Ancient Monuments, Listed Buildings or designated landscapes within the Cauldale area. Cauldale itself is however considered of local importance as an example of a 19th Century croft, a diminishing and under-protected part of the cultural resource, and features including a stone footbridge were identified within the area of the proposed construction site. In addition a horizon of flagged stones was identified on the dune edge, which could be the remains of a steading, or date back as far as the first millennium AD. A number of ships are known to have wrecked in the Fall of Warness in the last 300 years, and a Spitfire went down during World War II ‘off Eday’. Aurora Environment (2005) EMEC Tidal Test Facility Fall of Warness Eday, Orkney - Environmental Statement. Norris, J. (2009) European Marine Energy Centre: the development of a targeted environmental monitoring strategy and the streamlining of marine renewables consents in Scotland. In-Situ Ecological Interactions with a Deployed Tidal Energy Device; An Observational Pilot Study.